" Genealogy - Logan Luke - 1st Georgia Sharpshooter Battalion - Walkers Division Hospital, Lauderdale Springs, Mississippi. 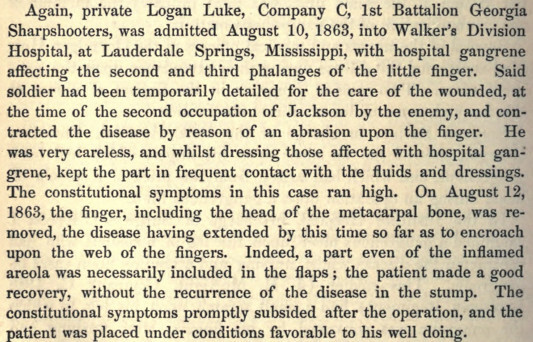 Medical Report of Logan Luke, 1st Georgia Sharpshooter Battalion. SOURCE:Surgical Memoirs of the War of the Rebellion, Volume 2.